Kickstarter has gone ahead and declared what most gamers have already noticed: in terms of crowdfunding, this is the year of games. 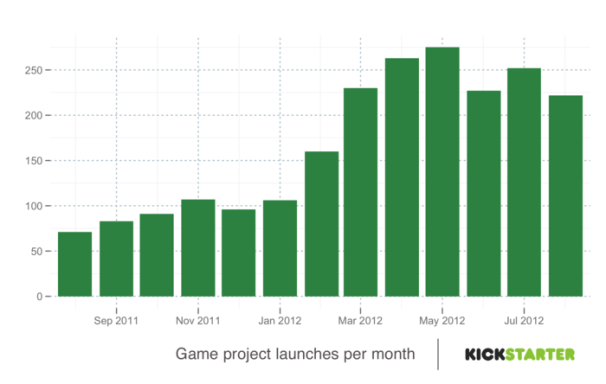 On Kickstarter alone game projects have raised over $50 million dollars, and there’s still four months left in the year. That number has rocketed games from the 8th most funded catagory of all time to the 2nd most funded; this year games have defeated all other crowdfunded projects, raising $8 million more than films, the second-highest funded category of projects. As Kickstarter reps are quick to point out, 7 of the 11 Kickstarter projects to reach the one million dollar mark this year have been games projects, while the 8th is the Order of the Stick Kickstarter, a comic about the game Dungeons and Dragons. Much of this convergence can be traced back to Febuary’s Double Fine Adventure raising awareness of crowdfunding for games, but as Kickstarter’s chart on gaming projects (posted above) shows the number of new games have stayed high after an initial spike, indicating there’s more going on here than just a bandwagon effect. If you want to learn more about gaming’s takeover of the crowdfunding world head on over to Kickstarter’s post that has more intriguing charts and facts including some surprising information on how all this has effected board and card game crowdfunding.